Glaciar Gualas drains from the northwest portion of the Northern Patagonia Icefield (NPI) into a rapidly expanding new lake Laguna Gualas. There is a spectacular icefall (I) where the glacier descends from the main NPI from 1600 m to 900 m, which is below the equilibrium line. Below this point the Gualas has a 2 km wide, 15 km long valley reach extending to the terminus which currently has a substantial calving face into Laguna Gualas (A-B). Point M inidcates an area of substantial moraine cover on the ice, that will with continued retreat be a likely location for a new lake to form, much as the periodic lake at Point C. Lopez and Cassasa (2011) have documented a 1.8 km retreat from 2001-2011 of this glacier, updating and expanding on the work of Rivera et al (2007). This is part of the ongoing inventory of Chilean glacier and the NPI, that is being undetaken by the Laboratory of Glaciology at the Centre for Engineering Innovation CECS (CIN), Valdivia, Chile. This project has built on initial joint work with Glacier and Cryospheric Environment Research Laboratory in Japan and now with NASA-JPL as well. The Japan Aerospace Exploration Agency with Glacier and Cryospheric Environment Research Laboratory published a comparison of selected NPI glacier retreats. 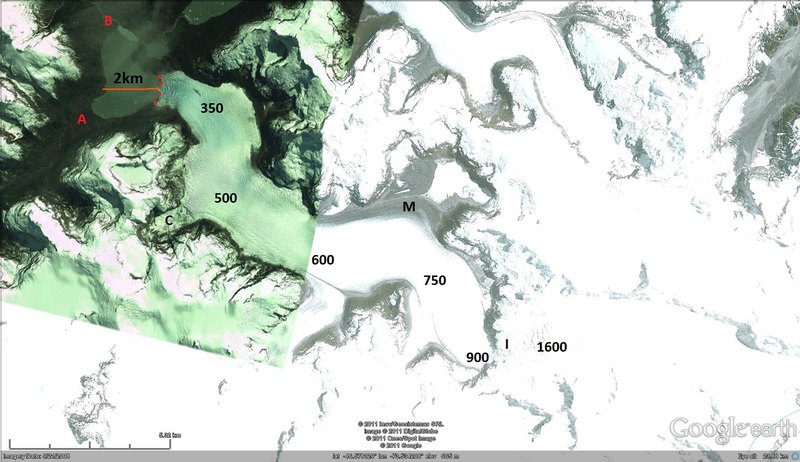 Here we compare Landsat satellite images of the glacier from 1987, 2001, 2005 and 2011 illustrating the retreat that Lopez and Casassa (2011) have chronicled. They have further noted an average thinning of the valley tongue of 2.1 meters per year from 1975-2005 and a doubling in the rate of area lost, 2.8 square kilometers, from 2001-2011 versus 1975-2001. 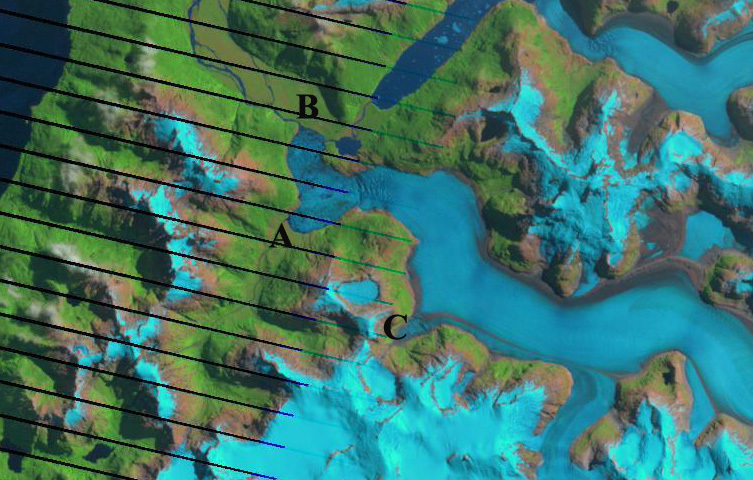 In 1987 the glacier essentially fills the lake basin, margin is indicated with pink dots. By 2001 an evident fringe of water separates the glacier from the lake margin on all but the eastern side of the lake. In 2005 the margin is hard to discern given the extensive floating icebergs in the lake. By 2011 the lake is evident and the glacier has retreated 2.2 km from its 1987 position. There is little additional change from 2011 to 2014. This retreat is like those of other NPI glaciers such as, Reichert Glacier, Steffen Glacier, Nef Glacier, and Colonia Glacier. The glacier surface is steep in the first kilometer behind the terminus, indicating a rising bedrock under the glacier. Then the glacier has a very modest slope for the next 14 km. As long as the glacier can calve into a lake, this will enhance retreat. 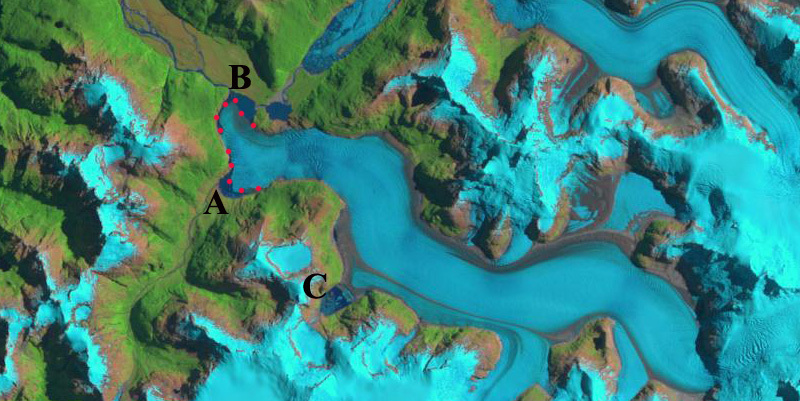 The current lake may not end at the bedrock step just behind the current terminus. However, even if this occurs the low slope above that point indicates another basin that will have sufficient depth to form a second lake basin. It is unlikely that the calving retreat of this glacier will have more than a temporary interruption. 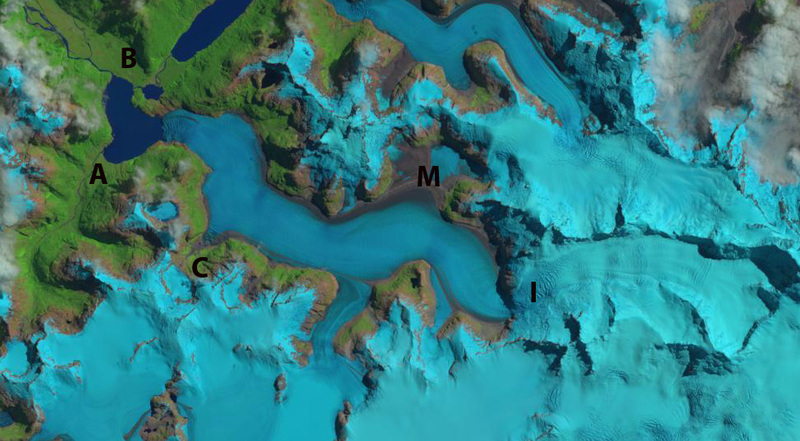 In the annotated Google Earth view below the approximate elevations along the glacier are listed. 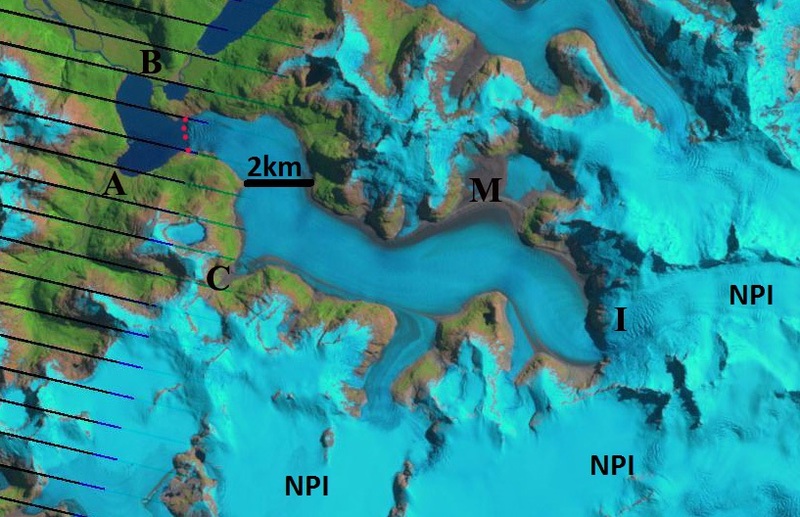 What is of particular interest is the 2.1 meter per year thinning on the lower glacier has occurred while on the upper glacier there is a small amount thickening (Rivera et al;, 2007). This implies the retreat is driven by enhanced melting due to warming, since the only way to thicken the glacier in the accumulation zone is via increased snowfall. 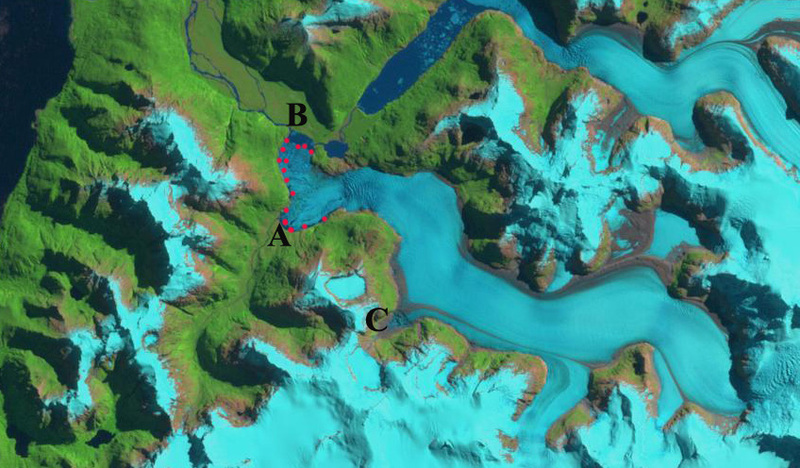 This entry was posted in Glacier Observations and tagged chile labaratory of glaciology, gualas future retreat, gualas glacier lake growth, gualas glacier retreat, northern patagonia icefield retreat. Bookmark the permalink.